SteamWorld Quest is coming to Nintendo Switch with an April release date, so get ready to check it out! 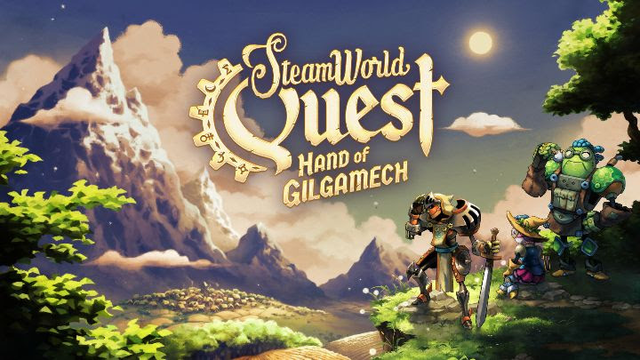 Thunderful Publishing is bringing the latest game from Image & Form, SteamWorld Quest: Hand of Gilgamesh, to Nintendo Switch this month. SteamWorld Quest follows a party of wannabe heroes who power up and train to take on enemy threats – that's where you come in. You've got to build a deck of cards that allows them to be powerful enough to take to the bad guys. You can choose from over 100 unique punch-cards to do so. When you've conquered each area, you'll be met with a treasure chest filled with gold, dragons, magic, knights, and various other fantasy RPG mainstays. The game is a mixture of traditional fantasy lands and tropes as well as steam-powered robots, hence the name. If you're interested in card-based combat and turn-based battles, you'll definitely want to check out SteamWorld Quest, even if the previous SteamWorld games may not have tickled your fancy. “The SteamWorld community has asked us to make an RPG for a long time, so I’m really happy and satisfied that we’re delivering such a polished title way sooner than anyone expected. Since we announced in January we’ve watched the growing excitement among gamers, press and content creators. I’m confident that fans of RPGs and previous SteamWorld games will adore SteamWorld Quest because it’s an absolute gem. We will keep the momentum going via our website and social media channels until the release and beyond,” said Brjánn Sigurgeirsson, CEO at Image & Form. Previous SteamWorld games in the series include SteamWorld Tower Defense, SteamWorld Dig, SteamWorld Heist, and SteamWorld Dig 2. All of them feature steampunk aesthetics and have been featured on various platforms. This entry is the first Nintendo Switch exclusive, though other titles have appeared on Switch. This one will be a timed exclusive. The game will be hitting Nintendo Switch first on April 25 and will be on the Nintendo Switch eShop for the near future. It will run $24.99. Too many games coming out in April, holy cow.